“I love my job,” says Rob Gray. “I build with LEGO® every day!” Gray, a long-standing member of Toronto’s meetings and events scene, has used the tiny building blocks in teambuilding activities for over 20 years. He launched Creative Club in 2009, an educational teaching program geared to students and corporate groups incorporating LEGO® and robotics. 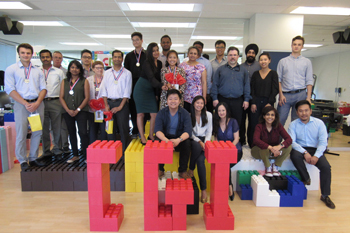 The company recently introduced EverBlocks® into the mix, an oversized version of LEGO®. A modular system of large-scale durable, plastic blocks, EverBlocks® make for some very versatile fun and learning. With an inventory of 3,000 blocks (180,000 pieces of LEGO®! ), Gray’s team facilitates teambuilding sessions customized to theme and purpose. Experiential workshops of note include an EverBlocks® Olympics that sees teams competing in construction challenges, even building the medal podiums and spectator seating for the post-games award ceremony. The giant, colourful blocks also make for novel décor, such as lounges, chairs, tables, bars, backdrop walls, even an entire display booth. They can also be used for designing unique marketing pieces, like logos, message walls and themed branding. With shipment across Canada, the blocks and pieces can be rented or purchased with Creative Club’s design-installation service or DIY instructions.